Mr. Glennis Connor, Anguilla’s Patron Saint of Lost Luggage. Photo by David Lansing. Luggage is like a child; the minute you take your eyes off it, it disappears. Which is why I almost always do carry-on. I want to know where my little guy is. I watch my little blue bag get transferred from the taxi at St. Maarten to the guy who puts a “CAP JULUCA” tag on it and wheels it down the dock to our boat. And then when we get to Anguilla, of course, my luggage is no where to be found. I’m frantic. The people who operate the ferry service are frantic. There are more walkie-talkies blaring at each other than at a Secret Service confab. And then up strolls Mr. Glennis Connor, operations manager for Bennies Travel & Tours in Anguilla. “I’ll get it,” says Glennis. And while half a dozen ferry reps run around the dock looking under tarps and interviewing bag handlers, Glennis disappears behind the office. Not two minutes later, he returns dragging my rather-sheepish looking carry-on behind him. And it was. 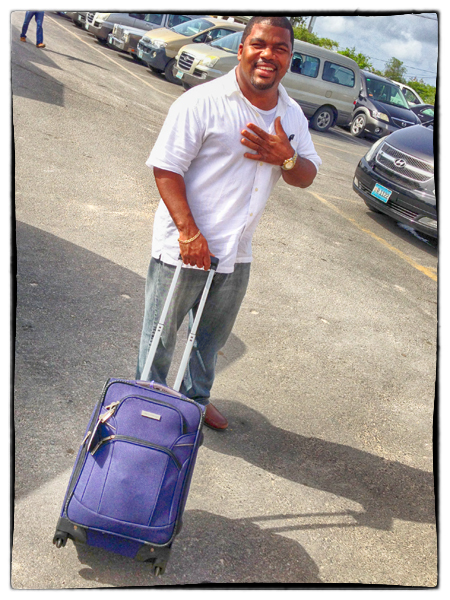 Mr. Glennis Connor: Anguilla’s Patron Saint of Lost Luggage. Excellent. Northwest Airlines once lost my luggage on a commuter flight from Bemidji, MN to Minneapolis. I was flying on to Seattle, but not until the next day. So the luggage would just have to come off the little puddle-jumper and into my hot little hands. But no. Apparently it wanted to go to Houston. I was forced to visit the Mall of America while I waited. So now I can say I’ve been there, too. Have a lovely time in Anguilla. The people there are awesome and go above and beyond to be of help. Look up Elvis at Elvis’ Beach Bar in Sandy Ground. He makes an awesome rum punch. I will definitely look up Elvis (as long as he hasn’t left the building). I absolutely loved Anguilla, however, I would enjoy nowhere without my luggage! Great blog. Keep up the good work.